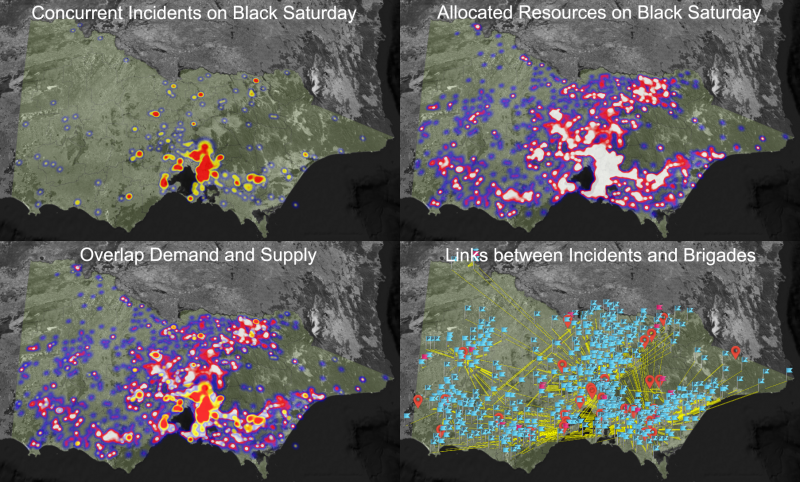 The project develops spatially enabled decision support tool to visualise volunteer firefighting capacity across Victoria and analyses Victoria's historic peak fire and emergency surge capacity responses from 1999 to 2015. It helps understand volunteer resource supply capabilities in busy seasons and identify research priority needs to enhance volunteer workforce planning capability. The project demonstrates the power of visualisation of historic data to inform the continuing development and enhancement of a wide range of emergency management policies and strategies and improve decision making and outcomes for communities impacted by emergencies. Demonstrated the need for the Disaster and Emergency Management Sector to be continually reviewing and leveraging technologies available for public use to develop open source “public safety grade” software applications that will move Public Safety Agencies towards a culture change in the adoption of real-time decision making that is based on predictive analysis. Demonstrated from a infrastructure perspective the need for continuing standards based investment in the infrastructure component (fixed and mobile) of the mission critical communications ecosystem that will allow the automated collection, analysis and creation of information to generate knowledge that can be disseminated to inform decision making as a core element of informed decision making relating to the deployment of assets. Demonstrated that the use of the tools produced by the Project will have applicability across all Public Safety Agencies and be globally attractive. Demonstrated from a research perspective the outcomes from the use of these visualisation tools should also be dynamically linked with long-term social and economic research and land use planning so that emerging trends can be identified at an early stage and accounted for in this research. Demonstrated that the use of spatially enabled information in decision making associated with the management of emergency events enhances outcomes. Demonstrated the ability to develop a methodology to produce a set of tools for spatio-temporal database analysis and visualisation utilising a common platform (the Intelligent Disaster Decision Support System – IDDSS). Demonstrated the ability to spatially enable evidence to inform a national approach to government policy and strategy development for emergency management; critical infrastructure policy; and national disaster resilience. Demonstrated the ability to spatially enable evidence for future inquiries into specific events by Coroners and Royal Commissions into specific events. Demonstrated the ability to use spatially enabled data, data analytics, and visualisation tools to transparently examine, evaluate and improve decision-making process associated with emergency management to build community resilience. Demonstrated the ability to improve coordination of operational effort based upon enhanced Situational Awareness and Complete Operating Picture. Demonstrated the continuous building of community preparedness and resilience is directly related to continuously enhance decision-making and information dissemination capability. Demonstrated the ability to dynamically visually assess decision making against predetermined performance measurements linked to operational objectives associated with both Situational Awareness and Complete Operating Picture. Provided evidence that the ability to distribute results and enhance decision making in real time utilising the public safety mission critical communications ecosystem is being prevented by the absence of a public safety mobile broadband as recognised by the “House of Representatives Standing Committee on Infrastructure, Transport, and Cities Report”. Provided evidence that the application of spatial analysis tools to historic databases should be expected to expose deficiencies in the data and data collection processes which will need rectification, particularly where these databases inform policy decisions and strategy development associated with the allocation and use of high-value discreet resources. Provided recognition that development of this capability and capacity will require collaboration between government, industry, and academia based on the sound knowledge of data, articulated analysis methods and elaborate visualisation means to meet the challenge of significant cultural and organisational change. Sep 7, 2016: This project was shortlisted in 2016 VICTORIAN SPATIAL EXCELLENCE AWARDS. Nov 30, 2016: Dr Yiqun Chen presented part of the project outcomes in GSDI15 conference in Taiwan. Volunteer Fire Brigades Victoria (VFBV); Mr Andrew Ford, Ms Judy Gouldbourn & Mr Joshua Campbell.